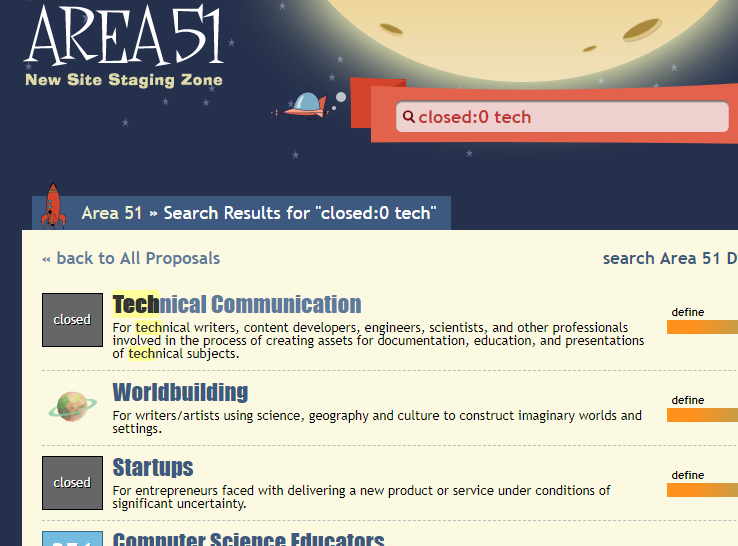 From this answer it seems that it should be possible to search for terms such as "closed:0" to get not closed proposals, which is the expected behavior in all the sites of the network. But as can be seen in this screenshot - it doesn't work, and there doesn't seem to be an option to filter to see only open proposals. Any reason it no longer exists? In short, it's so hardly un-updated that it's not worth the time and effort to improve it, since it somehow works. Maybe they're thinking of creating a new proposals sites, and therefore don't want to invest in this current site. Not the answer you're looking for? Browse other questions tagged area51-meta feature-request . Would a reputation/voting system oriented on peer-rewiew of scientific journals better fit science proposals than the current democratic system? Why are subjective questions and answers unfit for SE? Can an Area 51 group ever be completely deleted (and why close any)?